The White House Correspondents’ Dinner happened this weekend and mostly no one cared, rightly, until some journalists thought it was a good idea to criticize a comedian for telling the truth, which is what both comedians and journalists are supposed to do. Michelle Wolf was the comedian at this year’s dinner, and made some jokes about White House press secretary Sarah Huckabee Sanders that were both funny and pointed, in that they pointed directly at Sanders’ penchant for lying to the press. But reporters’ responses to Wolf advocating for truth at a dinner supposedly devoted to the First Amendment makes one wonder if they might be losing their ability to discern lies from truth, or forgetting that truth is our paramount goal. New York Times reporter Peter Baker tweeted, “Unfortunately, I don’t think we advanced the cause of journalism tonight.” It’s unclear whether he was commenting on Wolf’s performance or the absurdity of the act of news outlets spending money so their reporters can drink and eat undoubtedly gross food with the powerful people they’re supposed to be covering with a discerning, skeptical, truth-seeking eye. The purpose of the WHCD is ostensibly fundraising, but the amount of money it raises for scholarships is paltry, especially considering how much money an event in that type of venue typically raises. The tables are sold for a fraction of the price that is customary at such galas, likely in order to allow government officials to purchase them without breaking rules. Tickets for the dinner can’t be purchased by anyone who isn’t a member of the White House Correspondents Association. “Michelle Wolf didn’t fail just because she was (spectacularly) one-sided. It was because she was unnecessarily cruel on a night the WHCA was trying to showcase decency and purpose,” he wrote. The thing is, the only thing Wolf was one-sided about was the primacy of truth, which is the side on which journalists are also supposed to be. She skewered media and politicians alike. And it’s unclear what is meaningful about this dinner. From the outside, it is an embarrassingly solipsistic affair that makes its participants look upsettingly in need of social lives. Maybe Mitchell was actually upset about Wolf’s “Uncle Tom but for white women” dig. Times reporter Maggie Haberman, who watched the event on television (NYT Executive Editor Dean Baquet doesn’t believe reporters should attend the dinner), praised Sanders for sitting through the event. But presidents have sat through the same and worse for years, to little or no praise. I remember watching Stephen Colbert roast President George W. Bush in 2006 and cringing through fingers covering my eyes, marveling at Colbert’s ability to stand just feet away from the leader of the free world and call him out while looking him in the face. This is what comedy at its best does: It holds an unforgiving mirror up to generally unquestioned power; it’s the little kid in the crowd who shouts that the emperor has no clothes. At its best, it’s a collective conscience, delivered with humor instead of high-handedness. Setting aside that Wolf didn’t actually attack Sanders’ appearance (though some felt the softball joke was a pointed jab), it’s interesting that Brzezinski seems to think women are only off-limits to vile attacks if they’re married and have procreated. It’s a very Handmaid’s Tale valuation of women, which is notable in part because of the reaction to Wolf congratulating Sanders on her role as Aunt Lydia on the show. A large group of people who apparently cannot consider any woman distinct from her physical appearance decided this had to do with Sanders’ appearance, rather than her position upholding an authoritarian regime hell-bent on the subjugation of women and ethnic minorities. Which brings us to journalists’ general silence when Trump and his lackeys say cruel things about Muslims, Mexicans, and immigrants. Journalists believe they must remain mum, lest they appear biased. God forbid one has a bias against racism; that must be an enormous handicap in performing journalism in a nation that is projected to not have a racial or ethnic majority within the next four decades. The same night that Wolf made her true statements at the correspondents’ dinner, Trump supporters at a Trump event booed the mention of “Hispanics,” literally condemning an entire ethnicity — for the second time in a single week. TRUMP: Are there any Hispanics in the room? 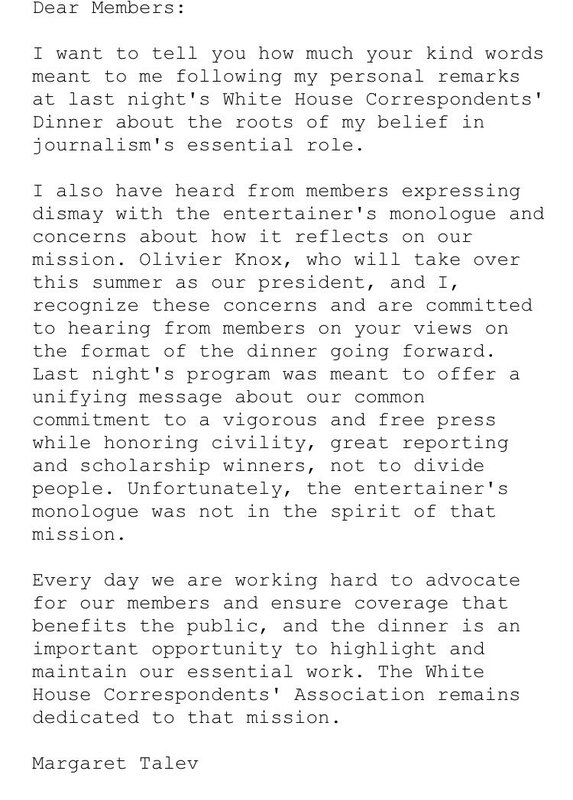 The Michelle Wolf WHCD performance allows the media to finger-wag about decency, look Very Fair to the WH, grease some trump orbit sources in the process, and complain about the dinner like every year (while also attending). It’s perfect! Certainly, it’s hard to view the gratuitous sympathetic tweets tagging @PressSec and the post-party “swarming” as anything other than thirsty, performative source-greasing. And I suppose reporters do what they must to get the stories they can. But I’d encourage them to avoid signaling to the American people that you either don’t realize or don’t care that we are being lied to every day, that we can’t trust you to recognize authoritarianism and fascism when you see it, that you are so far removed from the life of “citizen” in your pursuit of information of these elites that when they’re separating us into Childless Unmarrieds and Women Deserving of Respect, you’re not going to sit by quietly, unable to speak out, lest you show “bias” that inhibits your ability to claim an EXCLUSIVE! SCOOP! handed to you by officials who have decided they’re okay with that information getting out. Ms. Talev, the administration with which you are so eager to curry favor does not share your mission. While you were busy tripping over yourself to condemn a comedian for telling the truth, the Justice Department deleted language about press freedom — and racial gerrymandering, an issue very important to the public you serve — from its internal manual. You could have learned about that from BuzzFeed, one of the outlets that doesn’t attend your dinner on principle. Where is your statement on that? This silly dinner has been defended as a well-deserved “night off.” Take an actual night off. Talk to people who still answer questions truthfully. It can’t be that hard, even in Washington, D.C., to find a reason to dress up nice and hang with friends.